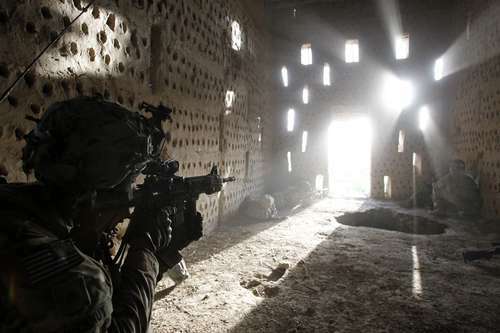 "U.S. soldier Nicholas Dickhut from 5-20 infantry regiment attached to 82nd Airborne points his rifle at a doorway after coming under fire by the Taliban while on patrol in Zharay district in Kandahar province on April 26." Sgt. Nicholas M. Dickhut, 23, of Rochester, Minn., died April 30 in Zharay, Afghanistan, from wounds sustained when enemy forces attacked his unit with small arms fire. He was assigned to the 5th Battalion, 20th Infantry Regiment, 3rd Stryker Brigade Combat Team, 2nd Infantry Division, Joint Base Lewis-McChord, Wash. Basic hygene items are always welcome, we are short on baby wipes in particular. healthy snack foods like granola bars or tuna are a great substitute for meals on patrols. Batteries, Flashlights, headlamps are all in short supply. Anything to better standard of living would be great. Thank you all so much!